The first Draw to Perform symposium curated by artist Ram Samocha took place in London on the 5, 6 and 7 of December 2013 and hosted by ]performance s p a c e [ and Arebyte Gallery. 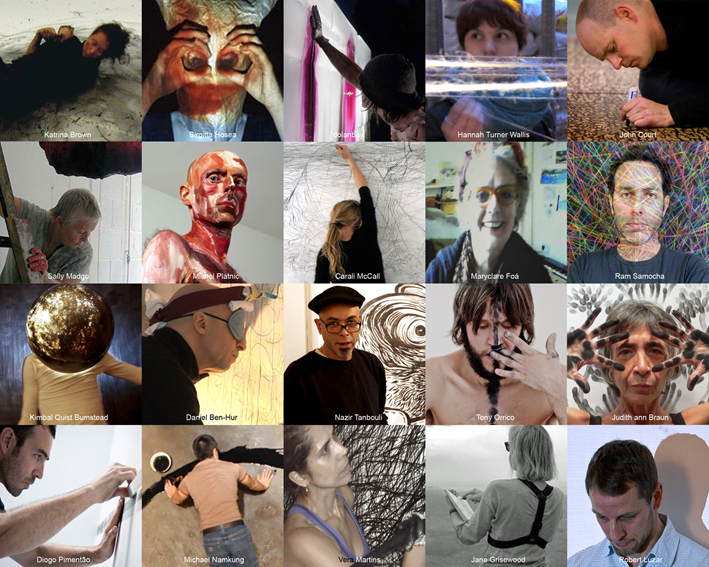 This symposium aimed to promote the growing stream of live drawing performance, to distinguish it as a unique entity and allow it to rise from the eclectic, wider definition of performance art. The participating artists all considered their body of work to be fundamentally concerned with drawing, in that for them drawing connects elements of line, movement, space and time. In their practice, mark-making is often a result of gesture and body movement. For some, drawing is rather conceived as installation, video, performance, painting, writing and animation. Many of the participating artists were interested in exploring idea of trace as memory and in connection to temporality. Others were focused on the physical and sensorial experience of drawing, either in relation to human body proportions or to physical exercise. Skype interview with artist Tony Orrico. Screening of video performances by John Court, Tony Orrico, Michel Platnic, dolanbay, Michael Namkung, Vera Martins, Daniel Ben-Hur, Judith ann Braun, Stuart Brisley, Diogo Pimentão. Live drawing performances by Robert Luzar, Kimbal Quist Bumstead, Katrina Brown, Ram Samocha, Hannah Turner Wallis, Nazir Tanbouli, Sally Madge, Jane Grisewood and Carali McCall, John Court, Vera Martins. Live performance by Maryclare Foá and Birgitta Hosea. Discussion panel: Moderator- Ram Samocha (‘Draw to Perform’ curator), Guest of honor- Nick Kaye (Dean, Professor of Performance Studies, College of Humanities, University of Exeter), and selected artists. Artist talks by Vera Martins, Kimbal Bumstead, Katrina Brown , Sally Madge, Daniel Ben-Hur, John Court. For Draw to Perform1 full schedule click here.